Perform common actions like run a search or check a checkbox when the enter key is pressed, instead of form submission. 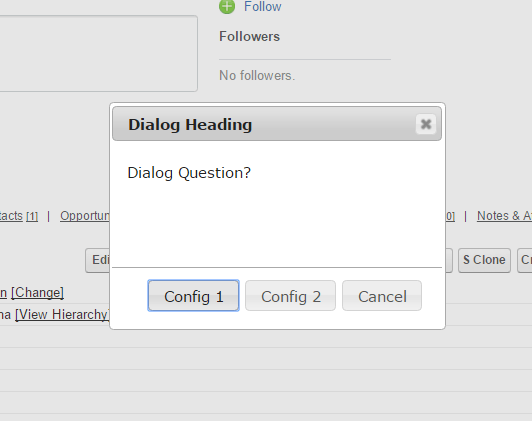 The example below shows how to do this with help from jQuery in the Visualforce page. event.keyCode == 13 is the key code for the Enter button. CSS classes are used to attach the keypress event handling, but you could also specify element types, names, or any other valid selector logic. searchFilter CSS class could be used on text, drop down/picklists, checkboxes, etc. .trigger(‘click’) is used below. It is similar to .click(), and they are interchangeable for this example. The difference that I’m aware of is .trigger(‘click’) can accept additional parameters. Probably only one or two of the methods below would be used in a real project. Multiple options are documented to illustrate different options. Most browsers will block popup windows the first time a popup window tries to appear. Here is how to check if a popup window was blocked. Making a popup window modal helps prevent it from being lost behind the main browser window. The following technique makes the popup window display above the window that created it. However, it doesn’t force the window to stay on top when other tabs or applications have focus. A popup window may be used to alter information related to what is displayed on the page that initiated the window. This may require the original page to be refreshed or redirected. Assign the URL to the window.opener.location.href property to change opener’s page. Changing the window height to adapt to content within the page can be frustrating because of variations in different browsers. Below is an example of one way to do it. I would not call it pretty, but it works well enough. First, it sets an initial size for the page. This is to specify the width, and the content will flow down the page based on the width. Second, we set the page size again because we can now tell the height based on the new width. Please comment if you’ve found a better light weight way to do this. Removing the last comma is often needed when dynamically building a SOQL Select string. Salesforce quietly released a bunch of new string methods in Winter ’13 that I have started to really appreciate. One of the new methods is removeEnd() and removeEndIngoreCase(). These are great for removing that last comma. If your data structure is a simple list of strings, you don’t even need the removeEnd(). The String.join() will form the string without an ending comma. Using a Visualforce tag with the escape=off option may help send an html tag like a line break to the page. However, escape=off can open cross-site scripting vulnerabilities. Visualforce encoding functions HTMLENCODE, JSENCODE, JSINHTMLENCODE, and URLENCODE help avoid the vulnerabilities, but they also prevent \n new line characters and html tags from showing on the page. I wanted an html line break <br /> to show on a page, but the JSENCODE function changes brackets into unicode \uC003C and \u003e equivalents. If you’re only expecting line breaks, one way around this is to wrap the SUBSTITUE function around the JSENCODE.